Food Siamese kitten should be useful and balanced. Don't feed only protein or plant food. It should have its own, designated place for feeding. 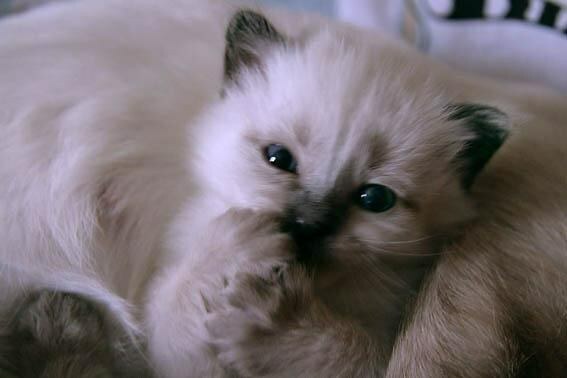 There are a number of products that is safe to feed a Siamese kitten. Meat and meat products. Raw frozen beef pour over boiling water before feeding. You need to give at least 30 g per day and no more than 500-1000 grams. Boiled chicken breast is allowed to give every day. Offal (liver, heart, lungs, kidneys). Let us only frozen and boiled. Note that the liver can change the coat color kittens white yellowish, it is not recommended to give it in large quantity. All the meat given to the cat raw, primarette in the freezer and pour over boiling water just before feeding. Chicken egg yolk in cooked or raw form can be given 1-2 times a week. Quail eggs better to feed raw along with protein. Milk and dairy products. Kittens can make liquid milk porridge. Dairy products try to offer yogurt, cheese, not sour curd can be mixed with cream or chicken egg yolk, giving 3-4 times a week. Vegetables and fruits let in cheese and in boiled form mixed with meat, in the proportion of 1 part vegetables to 2 parts meat. This will help prevent constipation in your kitty. Same goes for rice. For this cooked meat mix with rice in a ratio of 1 part rice to 2 parts meat. Water water purified and preferably raw, in any case, not mineral. Clean fresh water should always be freely available for the kitten. Siamese cats in any case it is impossible to give a number of products: bones of chicken, fish, pork, poultry (except chicken and Turkey). Fatty, spicy, salty, smoked, fried foods. Sausage and canned food intended for people. Sugar, chocolate, candy, cakes and all sweets. Chocolate can even cause death of the animal. Potatoes, beans, salt, spices. Medicines, including vitamins, designed for people. Many medicines safe for humans, may cause severe disorders and even death of the cats. If you decide to feed your kitten ready food, choose food in accordance with his age. No need to use food of different manufacturers. Select food of the same brand. Food must be served warm, but not hot. Up to two months Siamese kittens feed on their mother's milk. Therefore it is not recommended to wean a kitten from a cat until they reach 2-2.5 months.